Singer David St. Romain has found a new way to use his voice. You’ll still catch the well-known entertainer on local stages from time to time, but these days, St. Romain is more likely to be found in a classroom or some other spot before a roomful of children talking about staying safe. It’s a presentation he’s been preparing for the past year as an integral part of the Baton Rouge Children Advocacy Center’s One Voice initiative. The center’s mission is to help children who have been the victims of abuse or violent crime and their families find a solid path to healing and justice. For St. Romain, it’s the culmination of a journey 30 years in the making. At age 10, St. Romain was sexually abused by a neighbor. Last year, the 40-year-old St. Romain says he began opening up to the idea of talking about what had happened to him. He went public with his story at the Advocacy Center’s annual Celebrity Waiter event this past July. Many were surprised by the revelation. They knew St. Romain mainly from his singing. He was 24 when he’d made it to the finals on USA Network’s “Nashville Star,” and, after a 40-city national tour with his fellow competitors, he’d cut his first album on his own label. “It was all happening for me,” recalls St. Romain. But, he says, his close friend, the late Paul Neal, kept telling him music wasn’t his final destination. After Neal suffered a stroke, St. Romain says he told his friend he’d found his path. 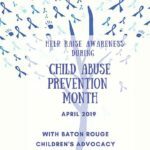 These days, it’s leading him into local classrooms and other locations to talk to youngsters about the importance of knowing who safe adults are, the difference between good and bad touching and what to do if they are abused or neglected. And, while it gets a little easier every time he shares his story, he doesn’t want to get too comfortable with the telling. St. Romain still plays music occasionally, but he closed his construction company to focus on his new mission working with BRCAC. He knows all about the chaos that results from childhood abuse. It made it hard for him to find healthy relationships. To report possible child abuse or neglect, call (855) 452-5437). Lines are always open.